This 2011, one of my resolutions is to quit drinking soft drinks or sodas, because I want to live a healthier life. In the absence of such drinks, I will still continue to drink different juice flavors, including iced tea, until I can eventually learn to let go of those too. Since I'm joining the healthier bandwagon, I am in search for great juice drinks that can act as substitute for sodas. Today, I purchased a bottle of Minute Maid Pulpy Orange from SM Supermarket. For a 330mL bottle of a healthy orange juice with real orange pulps, I guess the price is just alright at Php22.50. The big question is, "Does it taste good?" Many of us are afraid to try out healthy drinks because we are critical on how it tastes. Of course, we do not want to just be healthy, but also give our taste buds the pleasure of savoring these drinks. Now that I've tasted Minute Maid, I am here to spread the good news that it is indeed very tasteful and healthy because there are NO PRESERVATIVES ADDED to it. 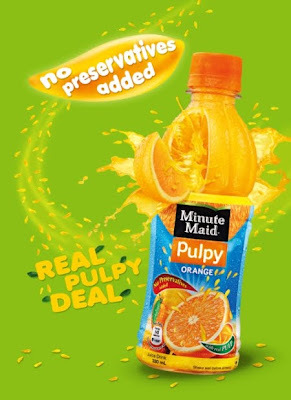 Minute Maid Pulpy Orange tastes the way orange juice should taste -- citrusy, orangey, with just the right amount of tangy sweetness. And it even has pulp! I swear, if it didn’t come from a bottle I would’ve thought it was freshly squeezed. It’s got real pulp bits from the first sip, down to the last drop! Whether I'm just at home, in the office or at the gym, a bottle of Minute Maid Pulpy Orange can surely quench my thirst and can even provide my body with Vitamin C (antioxidant). You ought to get yourself a bottle of Minute Maid Pulpy too -- not only because it tastes great, is pulpyliciously healthy, but can also win you cool cash in the coming weeks. For the meantime, check out the Minute Maid Facebook Fan Page.